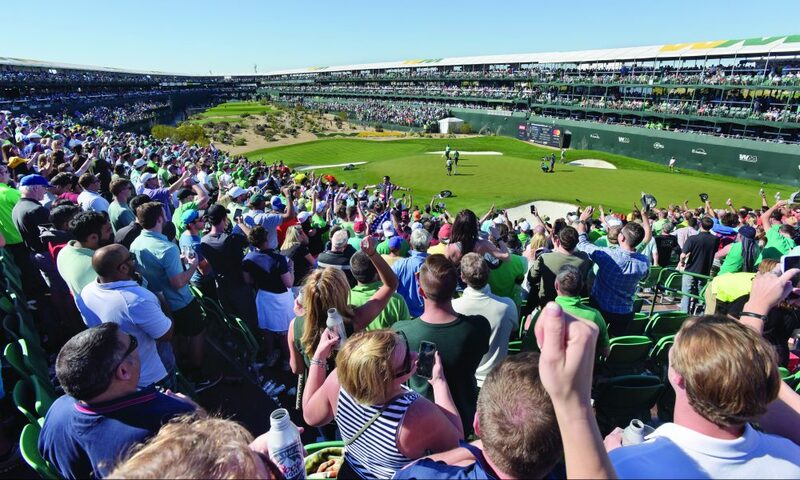 PHOENIX OPEN: For the first couple of years after the Houston-based Waste Management Corporation took over the naming rights to this event, the new name– the Waste Management Phoenix Open– fell a little hard on the ears, didn’t it? But I guess I’ve seen the light, because I now believe that there is perhaps no event in the world of golf more aptly-named than this one. The originators of the ancient game in Scotland probably never envisioned anything like we’ll see at Hole 16 this week, where those wasting time and getting wasted will definitely be in need of some management (sorry… had to). While the rowdy par-3 16th may be the headline attraction, TPC Scottsdale offers up plenty of chances for excitement. A par-71 that measures just under 7,300 yards, it’s a “grip it and rip it” type of course that tempts the longer players to challenge fairway bunkers and the native desert vegetation. If the longer guys are swinging the driver well, this turns into a wedge-fest, so we always see lots of low numbers here. 18-under played off last year, with Gary Woodland out-dueling Chez Reavie to claim his third PGA Tour victory. The previous two editions were both won by Hideki Matsuyama, and Brooks Koepka triumphed in 2015, so you get the idea: the ability to hit it long and straight off the tee is richly rewarded at TPC Scottsdale. You know who hits it long and straight? Jon Rahm does, and he heads BETDAQ’s Win Market for the second consecutive week. Rahm hung around until Sunday afternoon last week, and now he’ll look to finish the job at a place that’s treated him quite well over the years, with his 68.2 scoring average ranking second only to Hideki Matsuyama among players who have logged 10+ rounds at TPC Scottsdale over the last decade. Rahm (10.0) is joined atop the market by Justin Thomas (11.5) and 2-time champ Matsuyama (15.0), with a group of four or five guys behind them hovering around the 20/1 mark. There are a couple of interesting options among the long-odds types as well, and this tournament has produced winners like Kevin Stadler and Mark Wilson in the not-too-distant past, so don’t be afraid to act on any sneaky little feelings you may have. This is always a fun week. Rickie Fowler (22.0)- You could say that Fowler doesn’t win enough for a player of his stature. That’s fair. But he sure seems to spend a lot of time on the first page of the leaderboard, and we’ve certainly seen him get the job done before, most recently at the 2017 Honda Classic. Moreover, there’s no debate about Fowler’s ability to succeed at TPC Scottsdale– he’s been a veritable ATM machine at this event in recent years, finishing runner-up in 2016, T4 in 2017, and T11 last year, when he held the lead through three rounds before imploding. He’s actually been in 17th position or better after each of his last 12 rounds here, and his Sunday 73 last year marked the first time he failed to break par at TPC Scottsdale since 2015. He took a few weeks off after finishing 5th at the Hero World Challenge in December, but he shook the rust off at Torrey Pines last week and showed glimpses of form with a Friday 66, so I expect him to be ready to roll this week at a course he always devours. At better than 20/1, Rickie should not be overlooked. Daniel Berger (64.0)- An opening-round 75 led to a missed cut for Berger at last week’s Farmers Insurance Open, but I wouldn’t be overly concerned about his current form: he finished 12th at the Desert Classic two weeks ago, breaking 70 in all four rounds, and he responded to last week’s Thursday 75 with a 69 on Friday. Always aggressive off the tee, Berger thrives at places where he can swing away and rip the driver, and TPC Scottsdale certainly fits the bill. It should come as no surprise, then, that Berger has a terrific history at this event, making the cut in all four of his appearances and finishing 11th or better three times. He contended last year before settling for 11th after a final-round 71, and in 2017 he did the opposite, opening with a 71 but finishing with a flourish and ending up T7, just four shots out of a playoff. Berger has a very realistic chance of winning this week and should be backed enthusiastically at a price like 64.0. Martin Laird (100.0)- Considering that Laird hasn’t logged a top-10 since October and is currently trading at nearly 100/1, I suppose he’s a longshot in every sense of the word this week. But when he steps between the ropes at TPC Scottsdale, Laird, who resides in the Scottsdale area year-round, generally transforms into a contender. He’s racked up some great finishes in this event over the past few years, finding the top-10 in three of his last four appearances. Though he hasn’t won in awhile, he does have three PGA Tour victories under his belt, and if he’s ever going to ring that bell again you would think that it would come at a tournament like this, where he clearly loves the course and plays with confidence. He made the cut at last week’s Farmers Insurance Open, so we know he’s keeping it in front of him at least, and he’s just four starts removed from a top-10 at the Sanderson Farms Championship. At nearly 100/1, Laird is worth a shot this week.